TruXport has a smooth, sleek look-no "covered wagon" style arched bows. Fully closed to fully open in less than 30 seconds! Soft roll-up tonneau cover> at a "Snap Cover" price. Quick, Easy Operation, no bolts or tools required. Strong leather grain, vinyl-coated fabric in the industry. Save gas, save money $$$$$$$!!!!!! Based on gas priced at .00 per gallon & a vehicle that normally gets mileage of 15 miles per gallon. Put an end to the hassle of old-style snap covers. No cumbersome snaps to freeze, stick, rust or break. No more stretching the fabric to get it snapped. Continuous cover attaches the entire length of the rail. Easy operate in all climates. Perfect for cold weather operation and stays snug in hot weather. Seals on all four sides to minimize moisture entering the bed. 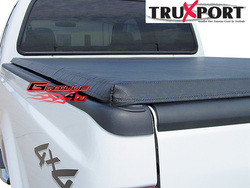 Unlike hard tonneau covers and some snap-style covers, the TruXport easily rolls up. This leaves the bed open for hauling large loads. The positive dual latching mechanisms provide added security. Cannot open cover without opening the tailgate. Provides added security with locking tailgate. Bows and rear cross member roll up with the cover-no parts to lose. Self-stores with 2 security straps behind the cab. Step1: Press down on rear cross member and push on o latch to open. Step2: Rear cross member and bow roll up with cover to form an even compact roll. Step3: Complete cover self-stores at front of bed with a security strap.